AKA - how to keep your cool and have fun despite feeling overwhelmed, nervous and scared about one of the most important gowns you'll ever wear! Unless of course you are the queen of England or Miss America **wink wink! Check out styles and designers that appeal to you and your budget. Research wedding gown pricing and know your budget prior to stepping foot into a salon. Don't be tempted to try on an $4k gown if you have a $1k budget - it's guaranteed that you'll fall in love with it and you'll A. be forced to feed your guests fast food in order to swing it or B. regret that you passed up your "perfect" wedding dress months even years after your wedding Stick to your budget and you'll find the dress that's perfect for you. Our off the rack gowns are $1500 and under. If your budget is $500 and under, we have a small selection that can be tried on during our open hours with no appointment needed - Fridays/Saturdays 10 am - 5 pm. Be prepared (and on time) for your bridal appointment. Be sure to wear minimal makeup and appropriate under garments. You will be spending a lot of time with a stranger who will be helping you in and out of gowns. Be honest with your consultant - if you hate a gown ... move on. Your feedback helps your consultant find what will work for you! On time is important! You'll have an hour with us, which is plenty of time for our gown whisperers to work their magic. If you are running late, please call to see if we are able to accommodate you. Generally brides arriving more than 10 minutes late will need to be rescheduled in order to respect our next bridal appointment's time. Our whisperers are pretty amazing, but anything less than an hour won't give you the time and attention you need. Don't try to cram shopping into one day. Two bridal salons in a day is a LOT and can be so exhausting that by the time you've gotten to shop three you will likely have forgotten where you even started your day. If you need to do speed shopping due to out of town Mommas, then try to keep your "trying on" to about 3-4 gowns per shop. Take pics if the salon allows and ask for designer/style info on the gowns that you like to help keep them straight. 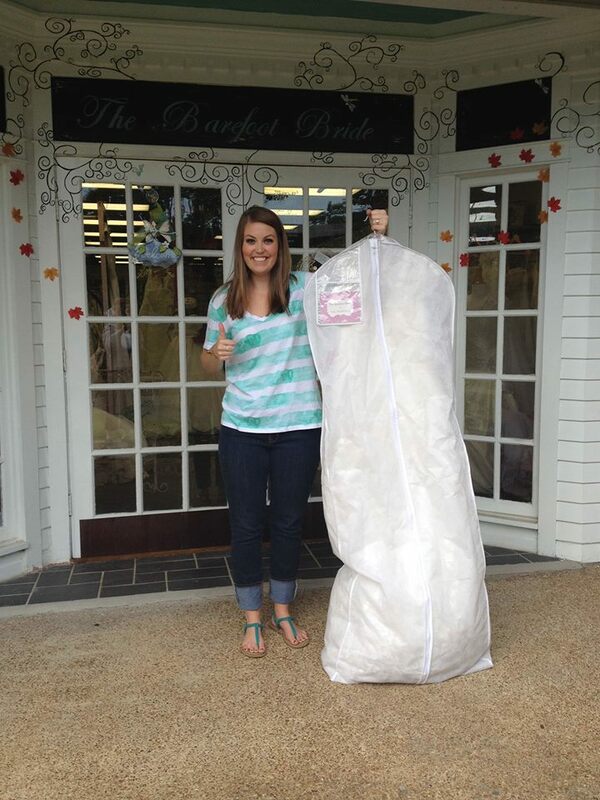 We know everyone wants to come help you pick out your gown! But keep your entourage to a minimum. This is for the bride's sanity more than anything else! Any more than 3-4 additional cheerleaders can become extremely overwhelming for a bride. Too many times we've seen brides melt under the pressure of everyone else's opinion. There's nothing worse than seeing a beaming face turn to tears because of a crowd who couldn't agree on what the bride should wear. The Barefoot Bride has a guest limit of 4 in addition to the bride. Children are INCLUDED in that guest count. Due to limited seating (did we mention that we have over 2000 gowns in stock?) We kindly request that guests are kept to a max of 4 at The Barefoot Bride. Supervised children are allowed and considered as part of the guest count. Don't wear satin in summer :) ... ok better stated, understand that you'll be in your wedding gown all day. Keep in mind the "theme" of your wedding, time of day, season of your wedding day to be comfy on your special day. Of course you are the bride so if you want to wear a full satin ballgown for your August beach wedding, by all means go for it ~ we're just saying that you are gonna be HOT and not necessarily in the way that you may want to be on your wedding day. Same goes for chiffon on a ski slope for a winter wonderland wedding ;0) We want to make sure you are happy, gorgeous and comfortable!! Wedding gown sizing is TERRIBLE! Generally you will be 1 - 2 sizes larger in a wedding gown than you are in your regular clothes. Be prepared to be shocked and appalled by this little detail. EVERYONE says "it doesn't matter" but because we have been programmed by magazines and super models, even the most self assured bride can be rattled slightly by this fact. Just be prepared .... it's no biggie. A size 10 wedding dress generally fits a size 6 dress size. Size 0's are more like kid's size 14s. Whoooaa - yup! It's true! More on sizing .... Wedding gowns are made to be altered! Alteration specialists can be our best friends when in comes to fit and comfort. Have you seen the brides with the strapless gowns that are forever tugging to keep the darn thing up? Well, they didn't have a good alterations person. A seasoned wedding gown seamstress can have your gown so it looks as though it was made for you without extra undergarments or heaven forbid SPANX!! (imagine trying to wrestle out of those on your first night as a married woman - not exactly a vision your groom may be prepared for) Wedding gown specialists are just that - they know what to do to make that once in a lifetime gown fit the proper way. Trust me ... a great wedding gown seamstress won't leave you tugging on that strapless gown or having your girls scratching their heads on how to decipher the bustle code! Brand new wedding gowns generally have an extra inch inseam on each side allowing for your gown to be let out a whole size, just in case stress adds a few extra lbs. Wedding gowns can generally be taken in 1 - 2 sizes ~ trying to alter any more than that can significantly change the look of your gown. Be sure to ask your bridal consultant what you might need in the form of alterations - It's best to find out before you've invested a bunch of moola and emotion in a gown that won't look like it did when you tried it on. It normally takes 4-6 months to order a wedding gown ~ yup, 4 - 6 MONTHS and that doesn't include alteration time. Be sure to find out if you are buying "off the rack", meaning the gown you try on is the one you take home or if you will be ordering your gown. If you order your gown, your consultant will measure you for sizing. Be sure to get a written copy of the gown designer, style number and your measurements to ensure you get exactly what you wanted in the size you need! Don't be shy about asking to see the manufacturer's size chart either, just to be sure you are all on the same page! At Barefoot Bride we sell "off the rack" so you can save BIG MOOLA ~ up to 80% off original retail prices. We also have a great selection of orderable gowns if you've got the time! Last but not least - Wedding gown shopping is not like the reality shows. Crying happens sometimes and sometimes not .... The truth is every bride is different. Some need to sleep on it and some just know. Most of the time we will see a dramatic change in the look on your face or the way you walk in your gown. Remember, this is all about you and your future hubby. All eyes will be on you on that magical day ~ so have some FUN while shopping!! Get excited ~ be silly ~ do your thing! This will be one of those moments you'll never forget!